A different way of flying. Modified the plans where I had flapping hinges of my own design. First video is learning how to handle it. There is no motor turning the blades. It is the wind. You too can do a loop. Finally got a handle on it. I love autogyros! A really different aircraft. I almost bought a Bensen B-8 until I found out in Canada you need a special gyro license for them. Not an endorsement... a full separate license. Had to back out as there are no gyro instructors within 2000km of me. Too bad as I would have been able to fly off my driveway, their takeoff and landing rolls are crazy short. What is the blade material? Do you have plans? 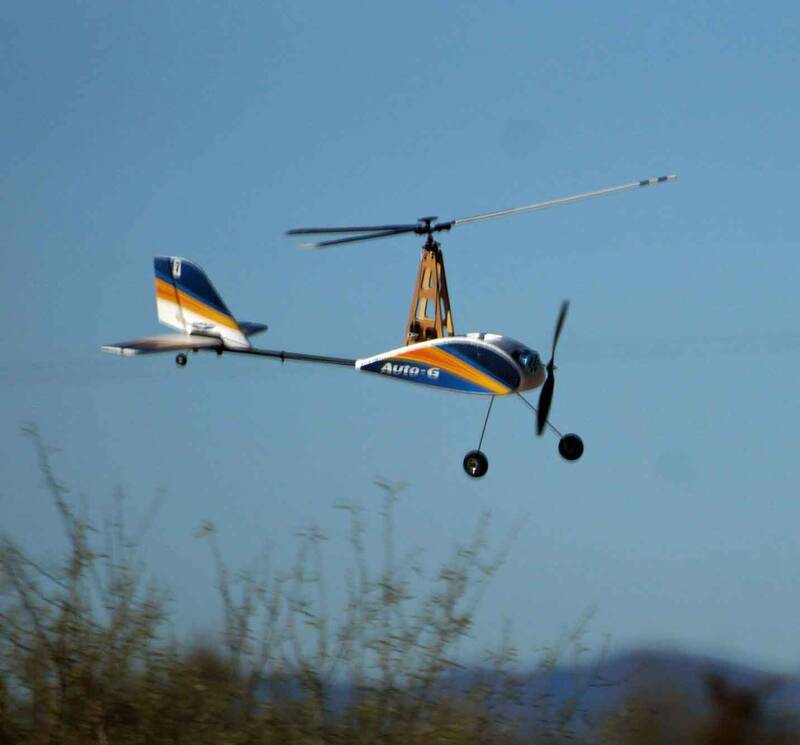 There aren't many RC autogyros out there. If you can post some still images in higher resolution, it would be cool to see. Very very awesome. Flies good. If you do power the rotor just Like on a switch will it just create drag or help it float? A personal love of mine! Any designs or related info always welcome! built a twin twirl that no one thought would fly. it flew. have intentions of building a new, improved twin twirl but i have a ton of other things taking priority. i will do it, just may not be for a bit. I have some heli blades laying around, I have been telling myself that I should build one for ages. When im done with the thousand projects I already have maybe. Will pull it out of my "boneyard" and I will do my part to help others. Probably will help it float. Need to think more about that way. Will do, since there is interest. I believe strongly that you can build this without power assist to the blades. First of all, get yourself familiar with the RC groups gyro area. So when it is too windy or cold to fly, grab that beer and go thru the pages and pages dealing with the Apache autogyro. Look for designs dealing with 4 blades and a simple fuse. Being a seasoned heli guy, this is what I first did after I built mine. This is half the battle in learning how to fly it. "Out of track" blades is a big problem. In the cellar, in a darken area, used a big box fan in front of "OTTO" gyro that is fixed in place, you get the Otto blades to turn and spin up. Being foam, they are out of track, so put red colored tip and black colored tip on opposite blades(that why 4) and using a florescent light bulb(pulses 60 cps and syncs in the dark) you can now see the red and black out of track(flapping hinges please,(try my design)). Now, add dab of glue at the blade end, spin again until you get in track. Add yellow and green color to other set of blades and get them to track. Now up speed of box fan, do a set of blades and now track the OTHER set to fine tune all blades for tracking. Again up box fan to top speed, and voila, all 4 blades will produce more lift and make OTTO more STABLE in flight. 1/2 the battle is over, Learning how to fly it takes a special knack. Dealing with torque, wind, angle of OTTO at all time is very important. Yes, you can loop OTTO with a nice headwind and height. Will cover that later and will bring parts out of my cellar boneyard. Pics to follow. For best details, start to look at RCGroups(you must sign in) and do a search to look at plans for foamy. 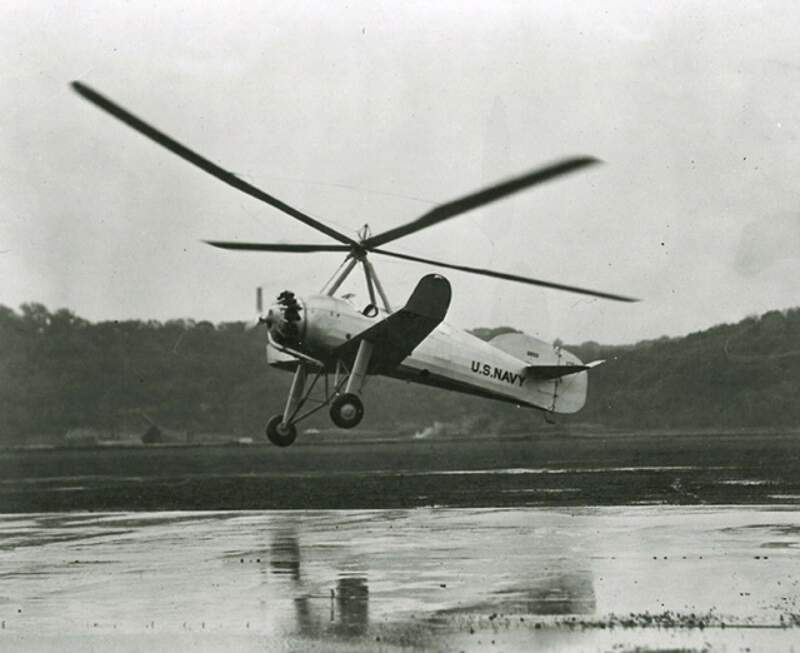 "Apache Longbow, Aerobatic foamy gyrocopter; VIDEO ; ** PLANS**"
This will start you off with a good background to read the 55 pages. View the videos and that will get you the understanding of how to fly it. IMPORTANT POINT, do not design it for aileron hinge--sloppy hinge and causes damage to servos as you crash. You will, plus light weight is better. It has been 4 years for me and I'm having trouble finding the blade diagrams but give me time. Otherwise, pick a set of blades that you like and go for it. I have the HK...well..what's left of it. I couldn't ever get it to balance correctly and it shook itself apart. Can anyone else actually find the Twin Whirl article anymore? Doesn't show up for me anywhere I look. I was going to give those plans another shot. 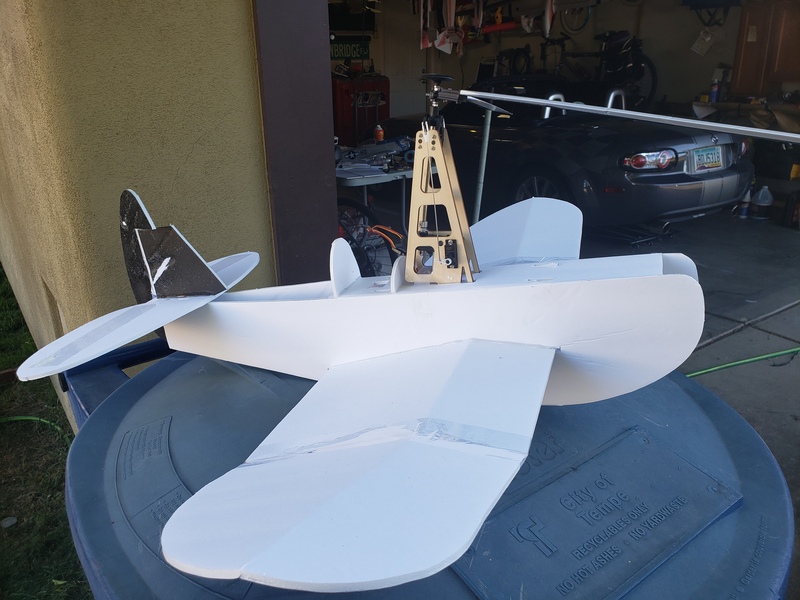 Revision 2 will most likely still use the Old Speedster as the frame, but I'm going to shorten and narrow the wings closer to the Pitcairn. 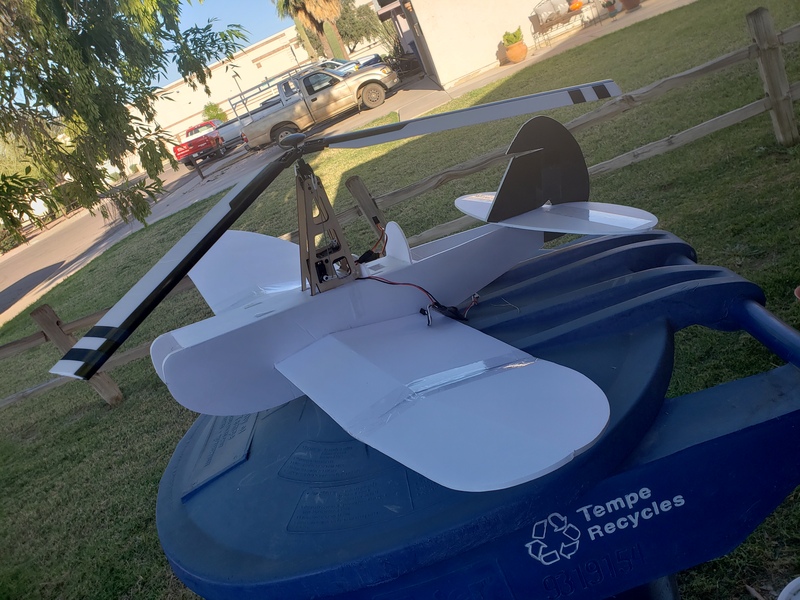 Ultimate goal is to build the rotor mast & head out of foam so it's reproducible (I don't think it needs to be powered) or at least get dimensions for something that works that can be 3D printed. Unless I can figure out a gimbal mechanism, you won't have ailerons unless you have an old HK G2 mast around. For the prototypes I'm (most likely) going to remove the power unit since it's heavy. FWIW - My HK Auto-G2 NEVER flew correctly. First, you need to build super light and your right about blades being made out of foam. Take out motor that spins blades. 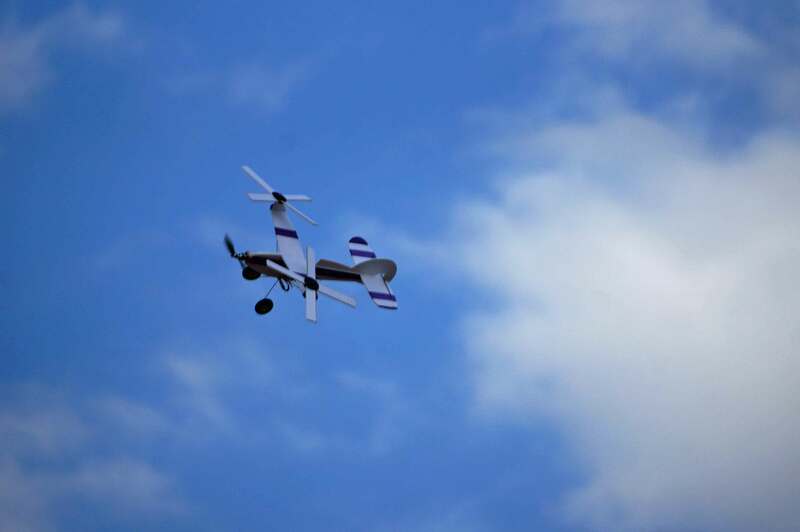 Since the gyro flies at a tipped up angle, your large width wing will definetly upset the lifting of the blades. IMHO, the blades have to be tipped aft more to give lift. Also, motor must have downthrust to counteract lift. This is a video of what the flapping hinge looks like that I followed. Still sifting stuff from RCgroups. Here is the dimensional sheet from a side view. I had to modify it slightly due to changing flapping blade length to 12" . Reason I decided to give it more area for lift, if you are trying your own, go for it. My new 3D printer is in the mail. My delta was giving me all sorts of issues so I bought an inexpensive cartesian style. Once I have it setup, I'll print out your pieces for the twirl.